Chia seeds are soaked in almond milk overnight, creating a delicious tapioca-like pudding that’s packed with nutrients and perfect for breakfast! 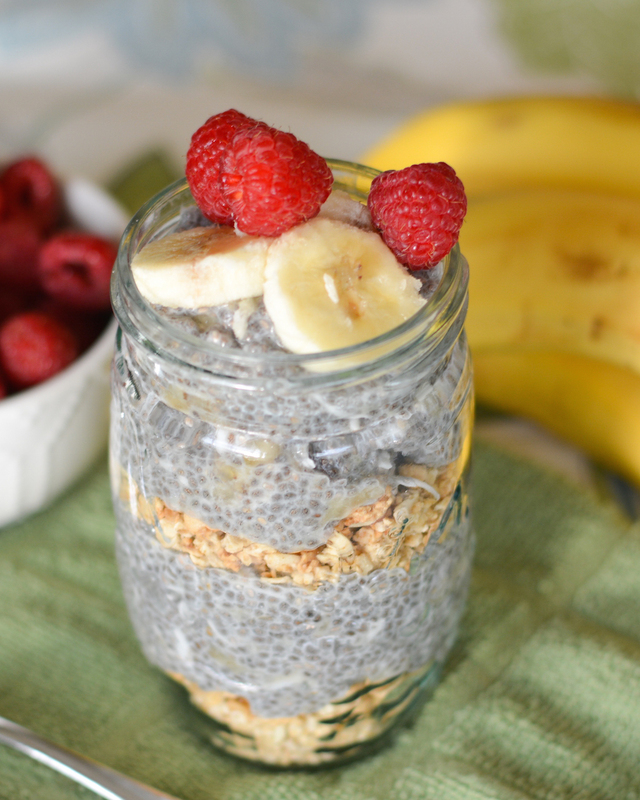 Layer the pudding with granola and fresh fruit for a chia pudding parfait! This post is sponsored by Blue Diamond Almond Breeze Almondmilk. All opinions are my own. Oh man, there’s a new breakfast obsession in our household. It seems a little odd at first, but boy is it delicious. Chia seed pudding! Have you heard of it? I’d seen chia pudding on the interwebs, and been a little intrigued, but I hadn’t actually tried it until we stumbled upon the most delicious little natural whole foods restaurant in Phoenix. Totally right up my alley. They had chia pudding parfaits on the menu, and even though we went at lunchtime, I had to try it. It was love at first bite. I hadn’t tried chia pudding sooner because I’m not too crazy about the texture of those liquidy chia drinks. But this restaurant made the parfaits sound so delicious that I had to try one. And the chia pudding was completely different than the drinks. It’s like tapioca or rice pudding, but even better, since I know how much nutritious goodness is packed into it. I spent the rest of our vacation thinking about the chia pudding, and as soon as we got home I was on a mission to recreate it. It took a couple batches to perfect it, but this banana almond version is just delish. We’ve been eating it nonstop! You can eat it warm, cold, straight up, or our favorite– in parfait form with layers of crunchy granola, fresh fruit and a drizzle of honey. The perfect flavor and texture combination. The chia pudding is really easy to make. 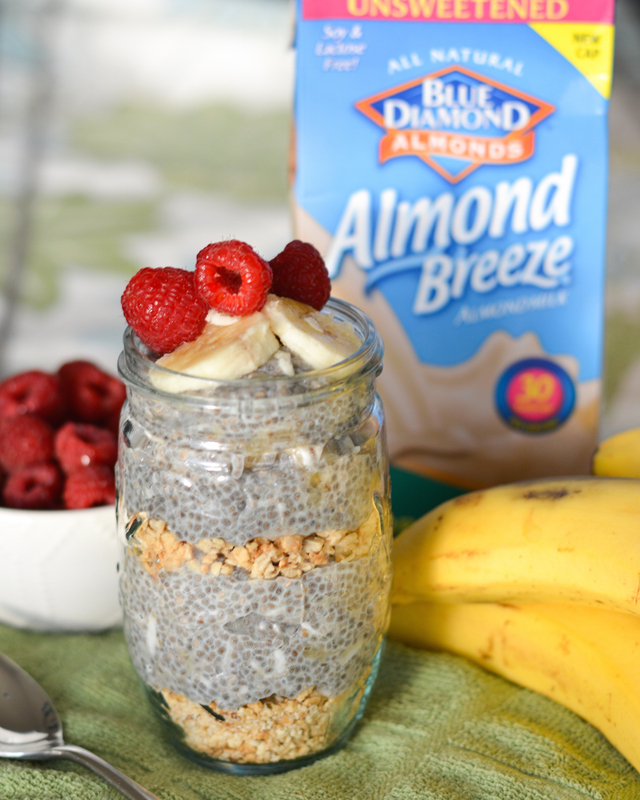 I mashed up a banana in a jar, then added Blue Diamond Unsweetened Almond Breeze Almondmilk, some honey, coconut flakes, and of course the chia seeds. Give it a good shake to mix everything together and let it sit overnight in the fridge. In the morning, it’s ready to eat! And you can even make it a few days ahead of time. You could leave out the coconut flakes, or swap maple syrup for the honey. The flavor combinations are endless, but the result is a super healthy and delish breakfast idea! It’s a great alternative to yogurt if you can’t have dairy, or if you just want to mix up your usual breakfast routine. In a quart sized mason jar (or medium bowl), mash up the banana with a fork. Add chia seeds, coconut, almond milk, honey, and almond or vanilla extract, if desired. Screw the lid onto the jar and shake well to combine everything (or stir everything together if mixing in a bowl). Place in refrigerator overnight (covered, if in a bowl). When ready to use, stir gently with a spoon before serving. Serve plain or layered with granola, fresh fruit and a drizzle of honey. I LOVE chia pudding! I was so skeptical at first but one bite and I was sold! This looks so delicious and I love that you layered it with granola! Thanks, Marcie! It was really yummy! I have been wanting to try chia seed pudding for years but have been afraid it would be disgusting. You have totally convinced me! Can’t wait to try it :). Pinned! Yes! It’s so different than the chia drinks. If you like tapioca or rice pudding, you’ll love it! I love love love chia pudding! I’ve made it for dessert, but I love your idea of making it for breakfast. Yum! And by using almond milk, it’s dairy free and I can enjoy it! Yes!! I definitely need to try making a dessert version. I’m thinking lots of chocolate. 😉 Thanks, Natalie! I’ve only made chia seed pudding once before, so it’s time to do it again! This banana almond version looks delicious! I love how easy it comes together, too. Sounds like the perfect breakfast! Yes! Making it in a mason jar makes it SO easy! Thanks, Gayle! I love the metamorphosis of chia seeds when you let them sit overnight. Such a great texture. This looks really wonderful. Nice and healthy breakfast. Oh I need to get on the chia pudding train! I love chia seeds in my smoothies and they are so good for you! This looks delicious! I am a big fan of chia pudding! Love that you layered it with granola! It looks delicious! Thanks, Kelly!! It’s such a fun breakfast!